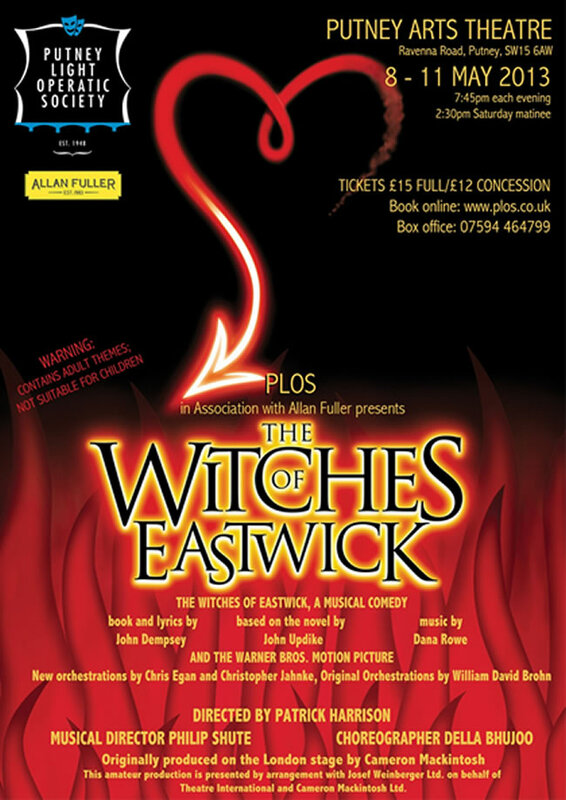 Putney Light Operatic Society (PLOS), sponsored by Allan Fuller Estate Agent is proud to announce it will be performing The Witches of Eastwick at The Putney Arts Theatre 8th – 11th May 2013. PLOS are believed to be the oldest amateur group in the Wandsworth area and one of the oldest in London, and are celebrating their 65th anniversary this year. PLOS has gained an excellent reputation for its annual family pantomimes as well as offering up new and exciting musicals to the amateur circuit which push the boundaries. Newly released to amateur theatre groups, the musical is based on the novel of the same name by John Updike. The story is based around three female protagonists, the 'Witches' Alexandra Spofford, Jane Smart, and Sukie Rougemont. Frustrated and bored by their mundane lives in the town of Eastwick, a shared longing and desire for "all manner of man in one man" comes to life in the form of a charismatic stranger, a devil-like character, Darryl Van Horne. Featuring amazing songs, such as "Something", "Dance with the Devil" and "I Wish I May" this is sure to be a wicked show to watch with amazing special effects to match. We're delighted to welcome back Patrick Harrison at the helm as Director, Philip Shute as Musical Director and Della Bhujoo as Choreographer. Wednesday 8th - Saturday 11th May 2013, with performance times at 7.45pm each evening with a 2.30pm Saturday matinee. Buy tickets online at www.ticketsource.co.uk/plos or call our box office on: 07594 464799. Please note that card payment is only available for online booking.